With its superhero-themed art, retro furniture, random ping-pong table and open floor plan, the Vermont Center for Emerging Technologies’ eye-catching co-working space—a little bit of Palo Alto plunked into Burlington’s FairPoint Technology Hub—is a fitting symbol for the dynamic contribution the economic development organization is making to Vermont’s start-up culture. But an everyday suite of offices in Winooski may tell the VCET story just as compellingly. The 5,000-square-foot space, tucked into an office park off East Allen Street, is home to SemiProbe, a fast-growing tech firm that, but for VCET, to borrow the developer’s phrase, might still be a gleam in the eyes of its founders. In 2007, VCET contributed space to the fledgling start-up, in the form of its Farrell Hall incubator on the UVM campus. Seed financing from VCET followed several years later, which spurred significant additional investment. Eighteen months ago, VCET helped recruit the company’s CEO, Doug Merrill. Today SemiProbe, which designs and manufactures equipment for quality-testing semiconductor components, has clients ranging from United Technologies to Sandia National Laboratories, eleven employees, two hires in the works, and the potential to add significantly more staff in the future. Those words are music to the ears of VCET president and business alumnus David Bradbury ’88 and confirmation that the approach VCET takes to launching and scaling start-up companies is on target. “Our goal is to create a density for innovation,” Bradbury says, consisting of three components he repeats like a mantra, all of which SemiProbe tapped into: people, VCET’s expansive network; places, the three physical spaces VCET runs, including Farrell Hall, the Burlington facility, and an incubator at Middlebury College; and capital, VCET’s $5.1 million seed fund, which, it uses to expertly leverage additional investment. SemiProbe is hardly the only success story that tri-partite approach has yielded. Since 2008, VCET’s fifty “portfolio companies”—those it provided seed capital to—have raised more than $172 million total in capital. In turn, those companies have lifetime sales of $133 million and a payroll of $112 million. VCET’s stellar track record prompted the Stockholm-based University Business Incubator Index to rank it the eleventh best university and college-orientated business incubator in the world and fifth best in the U.S in 2013. VCET’s expansion to the stylish Burlington co-working space—Bradbury uses the term reluctantly, since it’s equally a start-up incubator and accelerator—was a no brainer. When FairPoint Communications approached VCET board chair Frank Cioffi ’77, president of the Greater Burlington Industrial Corporation, in 2014, offering to help spur Burlington’s innovation culture by donating a floor of the company’s 266 Main Street building, Bradbury was all in. The space opened the next year, was an immediate hit, and now has close to 130 members, including remote workers from Google, HubSpot, and Twitter. “People are cordial and incredibly smart; it’s hitting on everything I could look for,” says Betsy Nesbitt, founder of Flyway Wellness, an outcomes-based wellness service that combines on-site yoga and meditation classes with proprietary data-based tools serving behavioral health treatment programs, as well as the business and hospitality sectors across New England. VCET’s reach extends far beyond Chittenden County to the 1,630 start-ups it has worked with around the state—Northern Reliability in Waterbury, for instance. When start-up costs caused cash-flow impacts for the firm, which creates batteries and other systems for storing renewable energy, VCET stepped in with bridge financing that prompted more investment and a team of advisors that helped reposition the company’s business plan. Last year it had record sales. It’s not easy being an economic development catalyst in the twenty-first century, as the start-up environment grows more competitive each year and entrepreneurs more sophisticated. “VCET has been substantially different every thirty-six months based upon the needs of our startups,” Bradbury says. Recently the organization has put emphasis on creating original content—in the form of a podcast called Start Here and networking events spotlighting female entrepreneurs. The Female Founders Series, created and managed by Bradbury’s VCET colleague, Sam Roach-Gerber, has taken the start-up community by storm, with nine sold out events over the last year and a half. While VCET has always been autonomous, it was born on the UVM campus, in part as a way to spur commercialization of faculty research. VCET launched in 2005 as an independent 501(c)3 in Farrell Hall with funding from the university, federal support secured with the help of Senator Patrick Leahy, and the Vermont Technology Council. 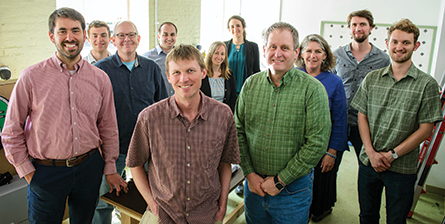 UVM is still a funder and remains closely connected through its faculty entrepreneurs, six of whom are in residence at one of the VCET facilities, and its students. Fully one third of VCET’s 188 members are student entrepreneurs and interns, many from UVM. That composition is attractive to Provost David Rosowsky, a new member of the VCET board, who would like to see even more students involved. As new companies form and grow, “that will create pathways and opportunities for students that could convince them to stay in Vermont,” contributing much needed youth to the state’s aging workforce and helping “drive a sustainable, prosperous, and compelling future for the state,” one of UVM’s overarching goals as the state’s land grant university, Rosowsky says. As important as VCET’s other contributions were to his company’s success, it’s the “people” element of the VCET troika that stands out for SemiProbe’s Merrill. STUDENT | The last task doctors face after treating their patients during a hospital stay is among the most challenging: conveying information at discharge —in a way that will stick—about their post-hospitalization medication regimens, follow-up appointments, and self-care. 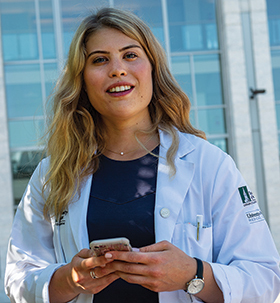 After observing how regularly her already harried physician-teachers had to repeat this information to patients post-hospitalization, sometimes in unnecessary meetings, Anna Lidofsky, a third-year medical student in UVM’s Larner College of Medicine, had an idea. “Patient education is really difficult in a hospital setting,” she says. What patients needed, Lidofsky thought, was an app that would capture their doctor’s instructions and make them easily accessible on their phones or computers after they got home. But how to turn that good idea into a real product? Lidofsky got two pieces of advice from an entrepreneurially minded fellow medical student who learned of her app idea: Apply for a grant from a student-managed venture capital fund. And make a beeline for the Vermont Center for Emerging Technologies. After applying for the venture funding, which came through, Lidofsky and the two fellow medical students she was developing the app with set up a meeting with VCET president David Bradbury. Things went well. “All of a sudden I was a member,” Lidofsky says. Having the physical space to meet—VCET’s co-working space on Main Street has several small conference rooms members share as well as a large common area—was great. But it was the other VCET members who offered the biggest benefit. “One day I saw David, and he said, ‘You should talk to the person who’s working right next to you,’” the founder of a company called OhMD, Ethan Bechtel (Business Administration, ‘04), who’d created a HIPAA-compliant texting app for improving communication among doctors in the hospital setting. The interaction and sense of community VCET offers has made all the difference for Lidofsky and her teammates. ALUMNUS | First there was online banking. Then there was online brokerage. What’s next in the technological transformation of the financial services industry? Something called digital advice, says Rob Foregger (Business, ’90), where advanced algorithms and artificial intelligence combine with brute computer power to offer users sophisticated investment counseling, supplementing or even replacing human expertise. The financial promise of digital advice, projected to be a $6.5 trillion global business over the next five years, is clear today. But it was less so when Foregger launched Next Capital with three partners in 2013. 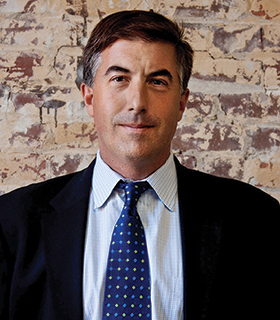 VCET president David Bradbury was one who saw the promise of the fledgling firm, which provides digital advice software and services for large institutional investment management companies like State Street Global Advisors, Transamerica, and John Hancock. Using its Vermont Seed Capital Fund, VCET made a vital early investment in the company. VCET’s seed funding helped attract $54 million in additional investment and spur rapid growth at the company. Today the Chicago-based firm has 110 total employees, including ten in Burlington’s Karma Bird House, a start-up mecca. Seed funding wasn’t the only contribution VCET made to the company’s success. It also provided workspace at its Main Street facility for the company’s first employees. Foregger also got good advice—the human kind—from Bradbury and his colleagues. Having launched three successful financial services firms before Next Capital, Foregger wouldn’t seem to need much help. But experience can take you only so far, he says. “When you start something from scratch, it can often be a little bit of an echo chamber. You want to really make sure that you surround yourself with good trusted advisors that will help not just shape your business, but also test some of the key hypotheses,” Foregger says. FACULTY | UVM electrical engineering professor Paul Hines, an active researcher who uses big data and computer models to unravel the mysteries of the power grid, wasn’t used to thinking of his work in commercial terms. But the ingenious algorithms he had developed with two faculty colleagues, Jeff Frolik and Mads Almassalkhi, which help electric utilities make greater, more consistent use of fickle wind and solar energy sources, were turning heads, helping the faculty win a small innovation grant from UVM and a large one from the U.S. Department of Energy. Hines’s initial instinct was to form a holding company with his colleagues where they could park the technology for future reference and get on with his research. “But the more we looked into it, the more we realized, hey, there’s an opportunity here. Let’s really put something into this,” he says. The group launched a company in earnest, called Packetized Energy, and made its first hire, Andrew Giroux ’15 G’16, who had just earned a master’s in electrical engineering working under Frolik. But where to put him? The obvious choice was VCET’s incubator space in Farrell Hall on the UVM campus, two floors down from Hines’s office, which had workspaces, services, and a shared conference room. The group met with VCET president David Bradbury. “It was a no-brainer” for both sides, Hines says. In addition to providing an office for Giroux, VCET helped the Packetized team feel like a real company—and look like one. “It was important to have a space that we could call home, where we could get our mail and give demonstrations of our technology,” he says. VCET was a help in other ways, too—particularly in the advice Bradbury and his colleagues offered faculty, used to making long-winded presentations at conferences, on how to succinctly sell the company vision at the ubiquitous pitch competitions that earn start-ups seed money and attention. The incubator space and advice have paid off handsomely for Packetized Energy—and the Vermont economy. Now in its own offices in Burlington’s Chace Mill, the company has six full-time employees in addition to the faculty founders, with the prospect of adding many more.